Discussion in 'General Discussion' started by davetanguay, Apr 19, 2010. These were available in previous versions. Screenshots are below to show this. Any ideas? I think most here know what those areas look like. What I'm wondering is are those screenshots from before or after the problem came up? These were available in previous versions. Screenshots are below to show this. You're stating that those buttons to download backups are no longer there/viewable? Or they still are, but no longer work? I have other servers as well and all of them that are running 11.25 the buttons are missing and are no longer there. For all of the servers that are running the older 11.24, the buttons are there and function properly. It seems as with the recent upgrade to 11.25 the system backups are no longer accessible to my customers via cPanel. I think the easy answer is, update your STABLE to the latest and see if anything changes. What happens if you click Generate a Full Backup there? If no errors, can you confirm the backups are being generated properly? 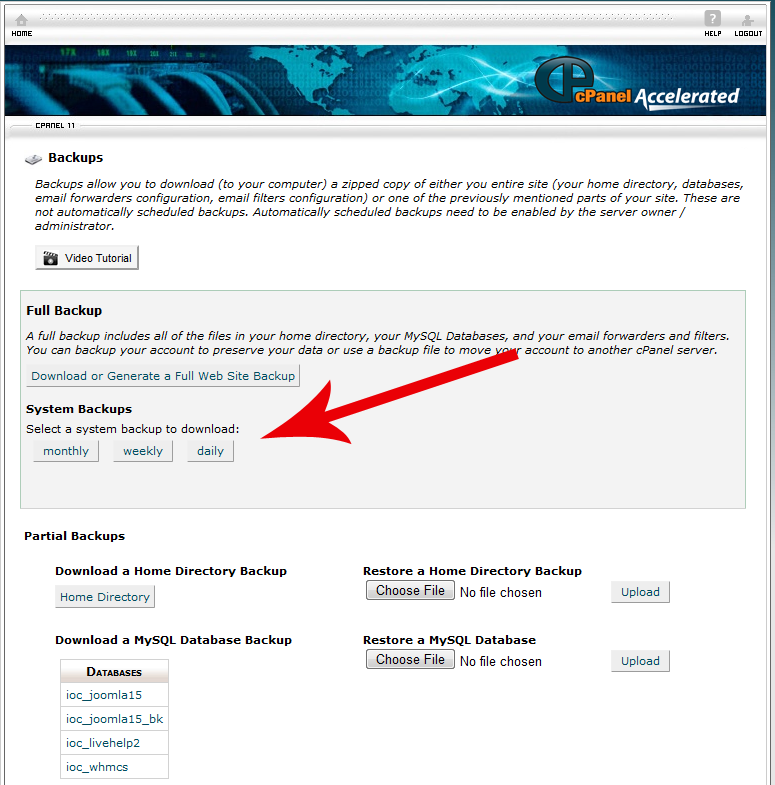 Still SYSTEM BACKUPS do not show up within cPanel. Daily, weekly and monthly they are performed correctly and yes when I click Generate Full Backup it performs correctly, I can decompress it and access the files within the backup once decompressed. Time for a ticket to cPanel support then. Do let us know how it goes. Did cpanel give you a fix for this? Had to upgrade cPanel to a new non-stable release. We are running version 11.30.0 (build 29) and have the same issue with missing buttons for the daily and weekly System Backups. Was this option removed in future versions? These buttons should exist provided daily and weekly backups exist on the machine. Are you showing any errors when loading that area in /usr/local/cpanel/logs/error_log location?